Left luggage and luggage storage in Paris ? The leave luggage is on Floor -1, next to the car rental companies. Opening hours are 6.15 am until 11.15 pm, every day. The leave luggage is on Floor -1, next to the toilets. Opening hours are 6 am until 11.15 pm, every day. 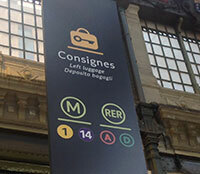 The leave luggage is in Hall 3, exit rue de Bercy (at the southern end of Gare de Lyon). Opening hours are 6.15 am until 10 pm, every day. Share your experience in the comments section. What to do in Paris on May 8th 2013 ? The website looks too good to be true... Any advise on it ? That time we were confused, we had to check out from the rented apartment in the morning while our flight was in the evening. Luckily we found this service in the internet. These guys did amazing job, fast response, well planned, on time, secured and off course with affordable and reasonable charge.We enjoyed the rest of time in Paris before leaving with a peace of mind. I really recommend your service. it exists a new concept of luggage storage in Paris city-center : City-Locker. There is 3 City-locker spots in Paris : 1 in Le Marais, 1 in Gare du Nord and 1 in Saint-Germain. I used to use their lockers and this is really easy and secure!